Channel siding is a popular type of lap siding and is used whenever a rustic appearance is desired. A versatile siding, it can be installed vertically, horizontally or diagonally. In channel siding the profile of each board partially overlaps that of the board next to it creating a channel that gives shadow line effects, provides excellent weather protection and allows for dimensional movement. 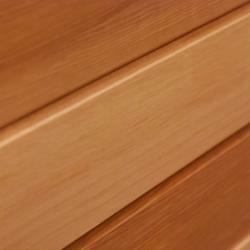 Channel siding is normally supplied in unseasoned knotty grades. The face side is saw textured. Commonly available sizes are 1x6, 1x8 and 1x10 Clear grades are manufactured to order. Lap siding has a little bit of overlap but is face-nailed for stability.